I managed to get in some sewing time this morning, and it pleased me greatly. 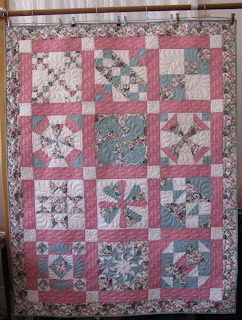 This isn't a quilt I wanted to make, I just did it because it would use up my ghastley 4-patches, and some fabric that was just a bit toooo thin for a good quilt, and some pink that I'd never managed to cut into since I bought it 5 years ago. So it was a surprise to find myself actually liking the soft drab look of the colours in the mid morning sun, as I sewed interminable border seams. 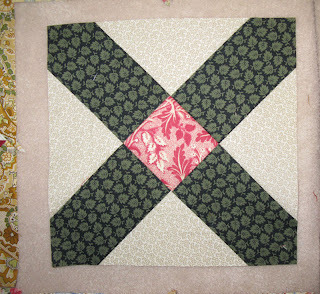 It's nothing special, but I've been thinking of it as The Verandah Quilt while I made it. 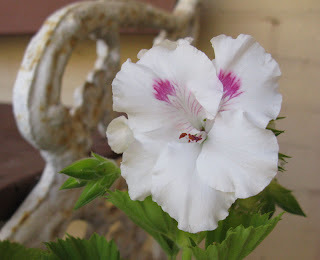 My Gran had two old wooden chairs on her verandah, padded with pillows that had faded and worn down to a shabby shadow of what they had once been. 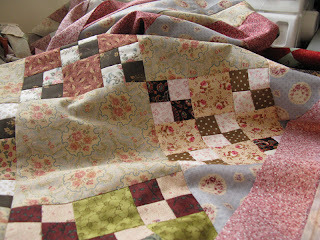 The setting fabrics in this quilt remind me of those old cushions, and of curling up in the chairs to read comic books. And I think this will be a nice quilt to use on my own verandah next winter, when I sit out there at evening with a cup of coffee and a quilt book. And still there were more 4-patches! I'm getting desperate to be rid of them, so I am making border strips to put in the Orphan box, and using some of my extra HSTs to make random Anvil blocks. I plan to use up lots of leftovers in these blocks, and see if they look too disgusting put together edge to edge. If they are awful I'll shove them all into the overflowing Orphan box and schedule a time to deal with them later. But I want the box of 4-patches Empty. 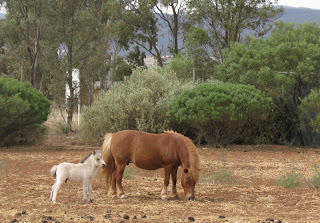 On the way into town the other day I glimpsed a foal in a paddock, and just had to turn around to take a photo. 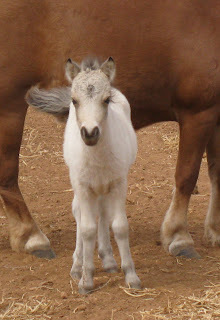 These Shetland ponies are adorable anyway, but the foal was just darling. The mother was only waist-height on me, and I'm SHORT. He was so little it didn't seem possible that he was real. It's been a busy time around here, but I think it will calm down now. I've met a few major deadlines and emailed off the files to their various destinations so I intend to have the weekend off. I deserve some sewing time. 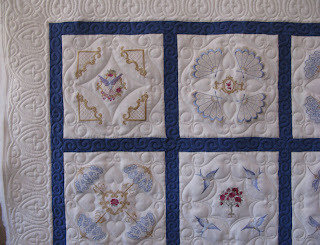 Yesterday I gave the owner of the blue and white embroidery quilt a binding lesson, as it's her first large quilt. 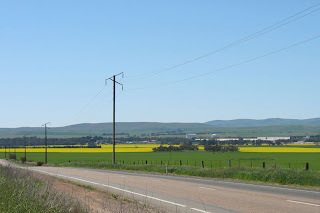 We chatted about this and that, and I mentioned that we wanted to walk the Heysen trail; she smiled at that, as one section of it skirts their farm close to the house. I told her we'd wave as we went past, and she said'Blow that,come in for coffee!' Sounds good to me; we may need a reviver if it's a tough section. I love how the network of quilters extends into other areas of life. I finished a lovely quilt this morning; it was delivered to us as a 15 year old UFO, who's maker had just about given up on it ever being finished. 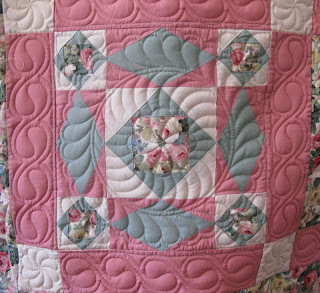 It had been completed in a beginner workshop, but no instructions were given for quilting, so our customer hand quilted it, but without backing fabric. She knew at the time that it wasn't quite right, became discouraged and shoved the whole lot in the cupboard. After a bit of thought I decided to leave the wool batting and hand quilting as it was, and to use a low loft Hobbs polydown batting beneath it to help take up the uneven areas of the quilt. 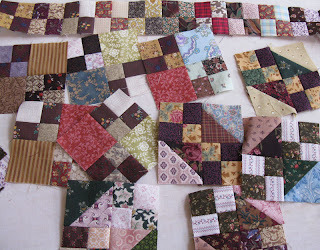 It was precisely pieced, and once I had it stretched out on Millhouse the quilting went quickly. I was thrilled at how it turned out, and so was it's owner. When she delivered the quilt she said that she would never make another one; she left today after having put her name down for our next class. A convert! She will make an excellent patchworker. Even with some discoloration this block was very pretty. Hopefully those marks will lighten once it's washed. 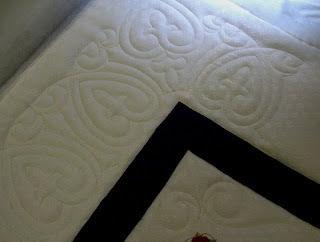 The dense quilting helped iron out the uneven handquilting. I love how this wreath pattern looks over the Storm At Sea block, very unusual. 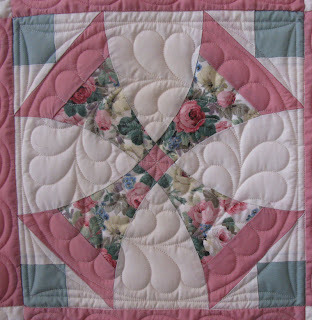 These are such old fabrics, I think we all had a piece of that rose print in our Stash. 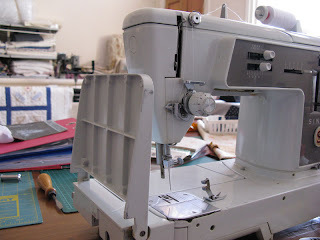 As well as the computer work and all the quilting we ran away to Adelaide last Friday to pick up yet more sewing machines and some furniture for the workroom. We made sure to stay caffeinated by frequent trips to McCafe and our trusty thermos of coffee in between. At one stage I actually ordered a tall Mocha with an extra shot of Expresso, just to keep me alert in the horrible traffic. My gosh it worked, and was delicious to boot. Triple caffeine will do that. On the way home the sunset was amazing, as it usually is. 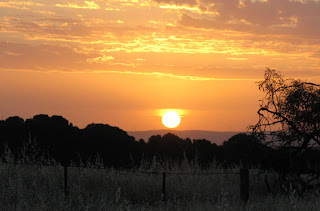 The clouds were so spectacular we stopped to watch them changing as the sun sank lower. Today is somewhat of a milestone in life. It's my 50th birthday, (it's October 21st already, here in Australia) and if you want to read the whole story of the circumstances surrounding my arrival in this world you can go here. And no, today is not Mereth's birthday as most people expect. See previous link. We have had to explain it a few times to friends who have never heard the story. It's amazing how news travels around a small town, we have been greeted several times with sly smiles and inquiries on our health now that we are getting so aged. It's just a number though; sometimes I feel 20 again, and sometimes I feel like an 80 year old! I have been taking note of the number of people who wistfully say 'I wish I was only 50 !' and I mean to enjoy my time on earth, not moan about how old I am. As our dear brother keeps reminding us, it's all downhill from here. And I reply that I will land on him at the bottom, because he's 13 years ahead of me. 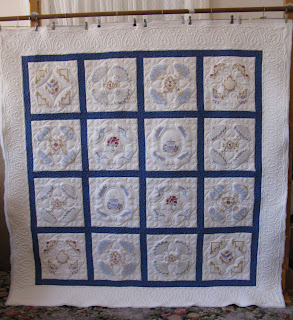 The embroidery quilt is off the frame and looks lovely; what a relief to have that finished. 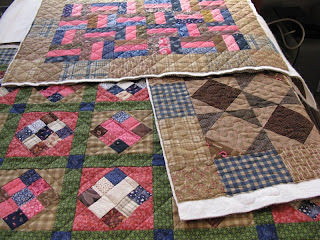 I immediately loaded all three runners and quilted them with simple patterns. Maybe I'll get the binding on later today and have three finished objects at last. What a good feeling that will be. Two weeks ago we went for a drive to Jamestown . 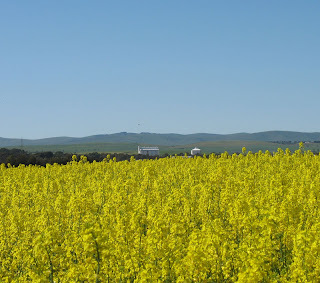 The canola was in full flower, and this field was brilliantly yellow. I stopped to take photos, and wished I could walk into the middle of the field and be entirely surrounded by all the flowers. It was amazing just being on the edge of it. 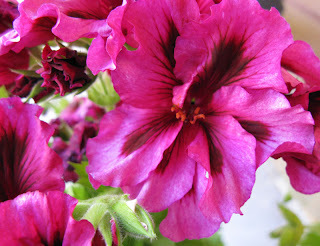 This is a close-up of the flowers; very simple, but stunning in those amounts. 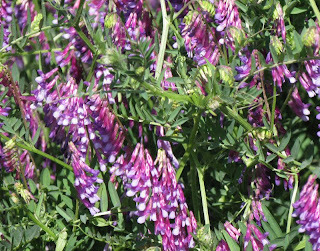 Then last week on the way to Laura I just had to stop and take a photo of this field of purple vetch. 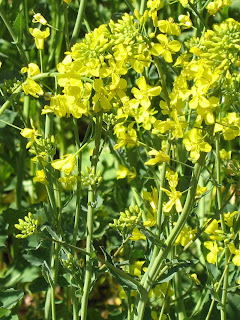 It's a legume crop, and the flowers were so pretty; the whole field was alive with bees and insects, which is a good sign. It would be terrible if Australia's bee population declined like America's has. We all take bees for granted, but they are a huge part of agriculture and we can't do without them. 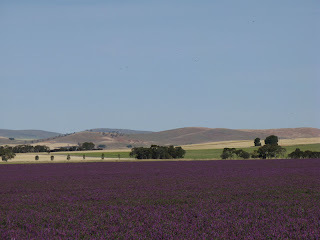 Wouldn't it be fun if the Canola and Vetch were planted in adjacent fields and flowered at the same time; what a patchwork quilt that would make. The last photos are of a car we spotted parked near a clearing sale in Jamestown. 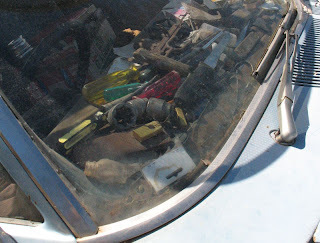 I couldn't believe that this man would drive around town with such a lethal mix of projectiles on the dash; there are 7 screwdrivers, some plumbing tools,a hammer and a KNIFE amongst all that rubbish. I just hope he never has to brake hard, or he'll wear the whole lot of it! This is the latest addition to the machine collection, a Singer 427. 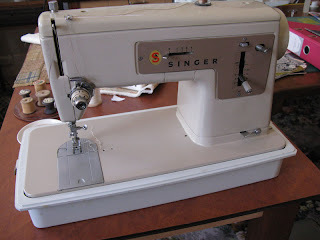 A local dealer has a friend who wanted to sell a vintage sewing machine, 'never been used'. We've all heard that before, so I was a little sceptical. I've seen machines advertised as 'in new working condition' and there's no foot or bobbin case, no cord and it's filthy. And some machines have been used very heavily, just not by the person selling them. However, I am convinced now. 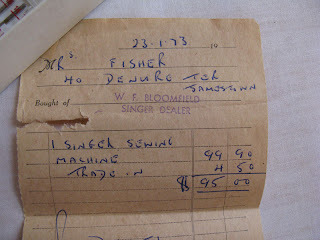 This is the receipt, from 35 years ago; $99.90 was a lot of money in those days. And there's a mistake in the subtraction; W. F. Bloomfield did himself out of 40 cents there. What convinces me it's never been used is that it's so stiff and pristine, and quite the nastiest old machine I've ever sewn on. She said that she tried it once, then went straight back to sewing on her old machine. I can well believe that. 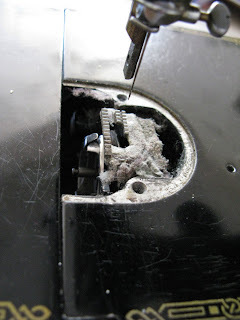 The clasps on the case were reluctant to come undone. It made an irritating noise when it stitched. It refused to do zig-zag for about 15 minutes, then jumped into it without warning. To oil it you have to take out 5 screws and turn the thing upside down. 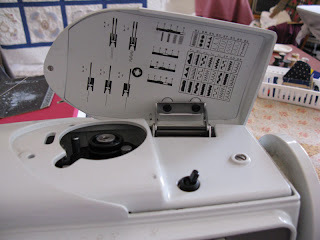 It's belt driven underneath, with a lot of nylon gears ( hence the noise when sewing). The access to the light bulb simply defeated us; another case of having to tip the machine over to get at it. It's the most grudging, reluctant, recalcitrant thing I've ever used. Small wonder it went back in it's box! What intrigues me is the trade-in price on the receipt. What did she use as her trade-in if she still had her own sewing machine to fall back on? Maybe an old family machine? We'll never know, but I probably would have wanted that one as well! So why did I buy this odd old machine? Purely for the power cord. Sad but true. Months ago I acquired a '60s slant shank Singer 631, a top range machine of it's time. It has embroidery! It has a storage compartment for the accessories! 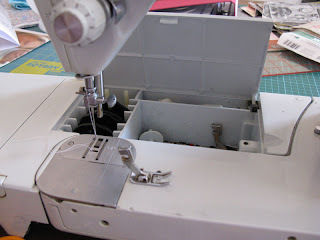 And a slide-off sewing bed to allow free-arm sewing! But it didn't have a power cord, so I couldn't even plug it in and see if it sewed. I just waited philosophically for one to turn up and it did this week, attached to the 427. It was worth the wait; it's a gorgeous machine to use, very quiet and responsive and a beautifully balanced stitch straight away. It has 3 needle positions, a near perfect 1/4" seam just using the edge of the foot, nice bright light, easy bobbin access. I LOVE it! It has multiple needle plates too, and the single hole plate is perfect for small things that can get shoved down the larger hole of the zigzag plate. The free-motion foot looks very functional, I'll have to try that out when I have a chance. I think this will be my backup piecing machine, after the 201P. I believe the end of the embroidered quilt is in sight; just got the two side borders to finish off, but that can wait till tomorrow. Every embroidery quilt we do seems to have it's own set of challenges; this one was beautifully made, but on polyester curtain fabric with a fancy jacquard weave. I hope it looks OK when it finally comes off the frame. Last week we had lunch at a tiny spot half an hour away. It's a hamlet called Stone Hut, and this is the hut it's named for. When we were kids it was still in good condition, roofed and with windows and doors. Now it's crumbling into oblivion, which makes me sad. I hate to see local landmarks falling into ruin. I love seeing the keystones the builders put into the original building, ready for when they wanted to build additions. It's pretty obvious where the building was extended here, the whole thing is falling off the back. 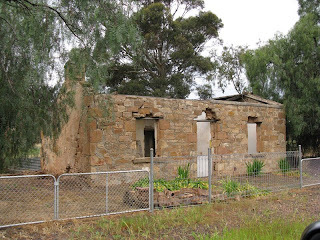 The idea of just gathering a lot of stones and adding a new room appeals to me; I always wanted to build a mud-brick house, but I'm too old now for such strenuous activity I think. Or too lazy. 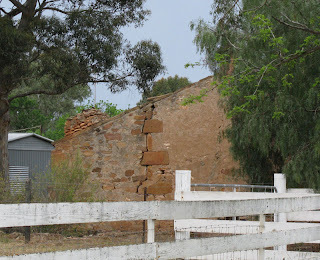 Still, imagine the size of your sewing room being limited only by your energy and how many mud bricks you could make! There is a wonderful bakery at Stone Hut, famous for their pies. Mereth and I drove over there last week just for their Spinach and Feta pie; it's amazing! We keep buying them and trying to reproduce them at home, but no luck just yet. We'll have to make a few more research trips. They are every bit as good as she says they are. 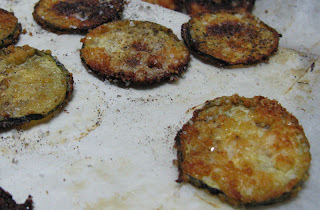 Below are zucchini chips, which I read about somewhere on the Interwebb. It's just slices of zucchini, cut as thin as possible, coated in eggwhite and dipped in grated parmesan, then cooked in a moderate oven till dry and crispy. They are really good. I seasoned the first tray with salt and pepper, but forgot for the second lot so they weren't as tasty. 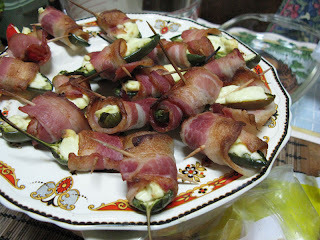 I'll be making these again. 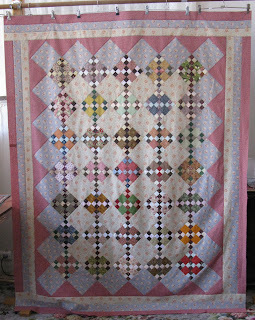 I hope that tomorrow I will have the quilt off the frame, my table runners loaded for quilting and some scrap sewing completed. At least I won't have to make lunch or dinner, with all those jalopenos to snack on in the fridge. 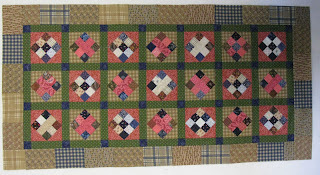 I astonished myself on Wednesday by actually finishing the piecing on this runner! It's not like me at all to have a good idea and see it all the way through straight away. 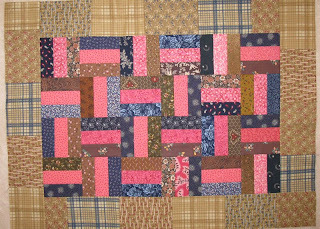 The border is from a set of fabric 1/8ths that I didn't really love; I bought it because I loved about half of the prints which are old and discontinued, and the rest of the collection are expendable. They are proving perfect for the runners. I used them around the edge of the next two as well. This is more leftovers from the Carolina Coverlet (overcutting AGAIN!). 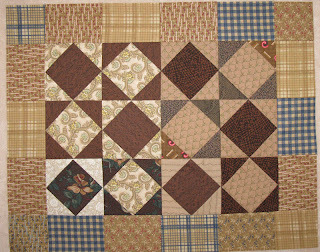 And this is some really ugly square-in-square blocks that I was on the point of throwing out. Oddly enough, as soon as I sewed them together they didn't look so bad after all. I am using this sewing as a reward for quilting an embroidery quilt that is taking a lot of time and effort and thought, which I don't enjoy right now. 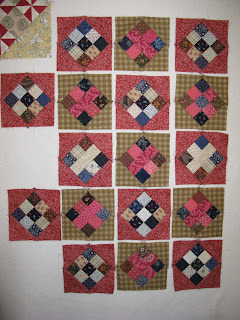 So every time I finish a block I run off and sew a few more seams to recover my spirits. 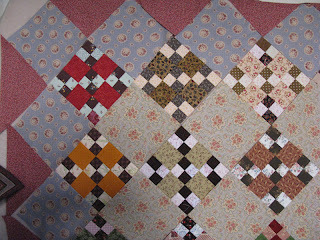 Four more blocks of the quilt to do, and then it's just the border to go. Can't wait till it can go back to it's owner. I think I will have to do a post on the effects of joining the Judie Rothermel fabric club. She keeps sending me more fabric!! I'm starting to feel overwhelmed, but I think that is just because I don't have a lot of time lately to use the new stuff. It's pilingup at an alarming rate, and causing me anxiety. I don't know what to do. I waited years to be able to join this club, I can't bail out after less than a year; I just have to use it up somehow. Or Judie has to slow down with the new releases. 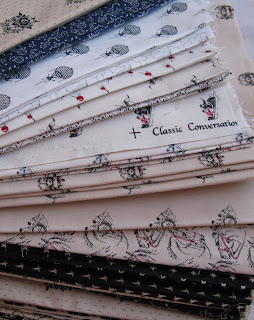 Somehow I don't want her to do that either; those conversational prints are just what my fabric collection needed. Mereth has been rummaging through baskets in my sewing room, holding up bits and pieces and saying 'What are THESE for?' And most of the time, I just shrug and say 'I don't know, orphans or crumb blocks, or... or ... something.....' So she made me decide to sew the leftovers from the Carolina Coverlet into little cross blocks, and very cute they are too. We need quite a few table runners for the workroom, so that's what this will become very soon. We had a lovely day last Wednesday, sewing with two friends. We went to the local bakery for a decadent lunch, and sewed on into the afternoon. They were thrilled with their progress on their quilt tops. Both are beginner quilters, and it's so lovely to see such enthusiasm and confidence developing. They both said they thought they would find it difficult, but managed beautifully and were rightly proud of their achievements. I amused myself by stripping down my new machines to clean and oil them. These two were NOT looked after. 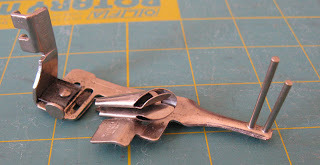 Both had thread jammed in the bobbin cases and this photo of the Featherweight gives you some idea of how unloved it was. I had to scrape this filth away; yech! I've oiled them both very well, and will clean them and sew on them when I get a spare moment. Interestingly, one of the manuals advises oiling with parafin oil if the machine hasn't been used for a while, letting it sit and then cleaning it off and oiling with machine oil. I'll have to get some parafin and try that. 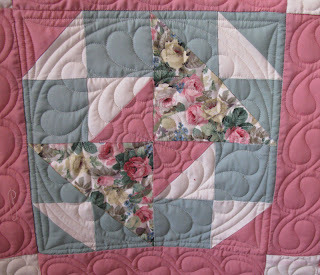 I have been sewing my pinwheel blocks dutifully, I have only 14 left to make. I still love them, so it's a pleasure to work on them, but I'll be glad when I can clean up all the material I've pulled out of the drawers for the quilt. I just can't seem to keep it organised and my sewing room is a mess. Once I have the last blocks cut out I will have a big clearing day. I've been trying to find the perfect leader ender, and tried this cross variation using some of the triangles from the other cross blocks. 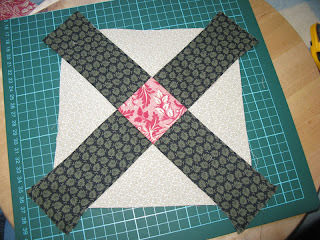 I cut the 2.5" strips for the cross at 5", sewed them into the block and then trimmed to whole thing square. It was fun, and I like the result, but it's not the right leader-ender project for me. Looks like my Orphan Box is going to be overflowing again soon.